Koffee With Karan Season 5 Episode 1 6th November 2016 Watch Online: After a long time, one of the favorite television host and filmmaker is back with his sassy show. He is none other than Karan Johar and his return to the small screen with KwK S5. One more time, the audience will get to watch VVIP and ultra, stylish guests. 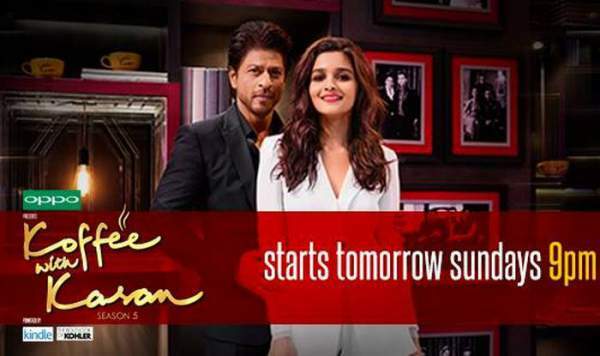 Karan will mark the start of the latest installment of his show with his best friend Shahrukh Khan, and Alia Bhatt will accompany him in the first episode. Both of them will promote their upcoming movie Dear Zindagi slated for a release on November 25 this year. This show will air Sundays at 9 pm IST on Star World and Star World HD. As usual, the first episode of the fifth installment will be a blast for sure. It becomes a necessity and obvious when witty SRK makes his presence feel. Also, Alia will appear as a true diva with her outfit on the show. She will go away for her usual teeny-bopper avatar. So, can you guess what Karan will ask Shah Rukh Khan this time? Watch: The Kapil Sharma Show 6th Nov. 2016. Although SRK has made it to every season of the show, season 4 went to Salman Khan’s “I’m a virgin” comment and Anushka Sharma’s lip job. Check: Rs 2000 Note Trending On Social Media. We have got to know one of the questions which KJo will ask SRK, and it goes like this, “What would he do if he woke up as Ranveer Singh (actor)?” The Bollywood’s romance king replied in a witty style and said that he would, waking up as Ranveer Singh, ask himself where he got his padded underwear from! What do you think, Deepika Padukone will think of SRK (her Bollywood mentor) talking such stuff regarding her beau? Well, we can get an answer from her if and when she makes an appearance on this show. Did you forget the storm created by Deepika and Sonam Kapoor about their ex-boyfriend Ranbir Kapoor? Let’s see if Alia gets nervous with the underwear and s*x talk on the show. In the meantime, we can guess that not everybody will be able to make sense of Shahrukh Khan’s sense of humor. SRK once said on Beneath the Surface that people have lost their sense of humor and have become touchy about things. Thus, at sometimes, we require this kind of funny and shameless show to fill our lives with fun.